Samsung has given the world a glimpse of a phone with a bendable screen, dubbed the Youm, suggesting that consumers may soon be able to fold up large phone or tablet screens as if they were maps. The Korean electronics company showed off the device at a keynote speech Wednesday at the International Consumer Electronics Show in Las Vegas. The annual convention showcases the latest TVs, computers and other consumer electronic devices. Brian Berkeley, head of Samsung Electronics Co.'s display lab in San Jose, Calif., demonstrated a phone that consists of a matchbox-sized hard enclosure, with a paper-thin, flexible color screen attached to one end. The screen doesn't appear flexible enough to fold in half like a piece of paper, but it could bend into a tube. The Youm uses organic light-emitting diodes, or OLEDs. Only a thin layer of these chemicals is needed to produce a bright, colorful screen. They're used in many Samsung phones already, though with glass screens. For the bendable phone, Samsung laid the chemicals over thin plastic instead of glass. That's a trick you can't pull off with liquid crystals in standard displays. You could pack a bigger screen in your pocket. In a more conventional application, Berkeley demonstrated a phone with a display that's rigid, but bent around the edges of the device, so it can show incoming messages even with a cover over the main screen. In short, OLEDs free designers to make gadgets with curved screens. It's tough to use a touch screen if it bends away from your finger. Flexible OLED screens have been demonstrated for years, but the OLED chemicals are extremely sensitive to oxygen, so they need to be completely sealed off from the air. Volume production of flexible displays that remain airtight has so far stumped engineers. Samsung's screens aren't yet flexible enough to fold, just bend. Samsung didn't say anything about when flexible displays might be commercialized. 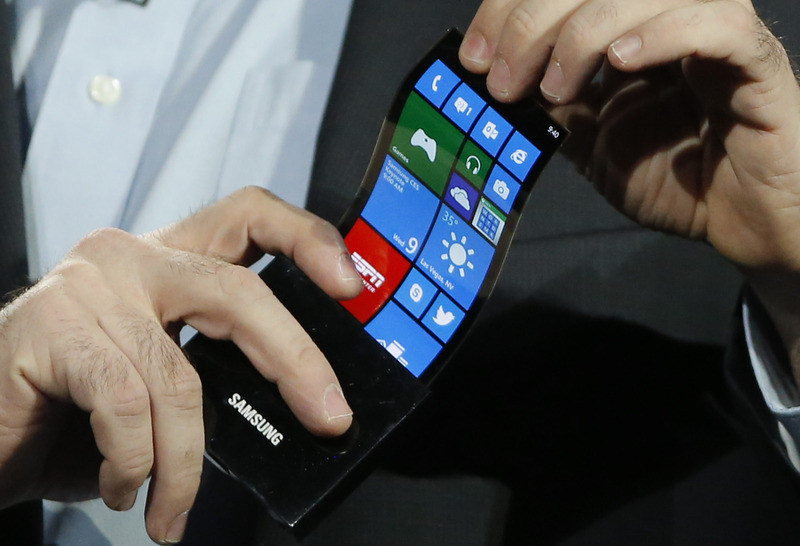 According to CNET, this isn't the first time Samsung has demonstrated a flexible screen. The electronics giant showed flexible, transparent displays at International CES in 2011. "The concept of the flexible screen has been around for some time, but it finally looks as if Samsung is really going to deliver on that technology," said Stephen Bell, an analyst with Keystone Global.